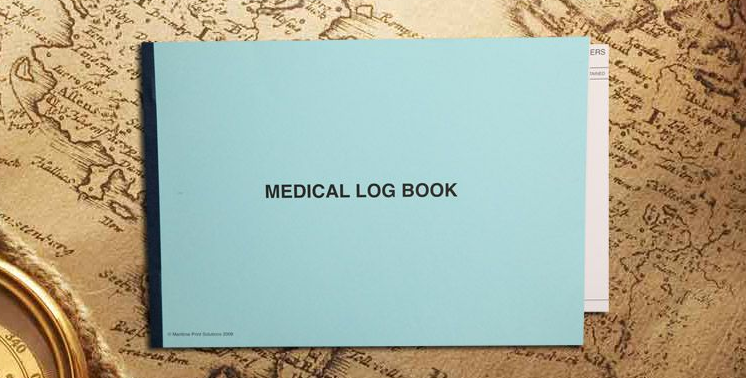 Keeping a diary of your symptoms can help you diagnose your health issues quickly, it will help you determine triggers and provide a log as a reference. 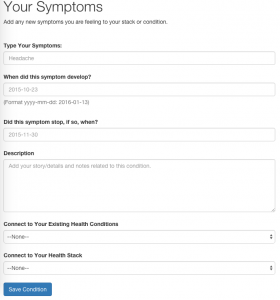 TrackMyStack is the perfect tool to track your health symptoms easily. If you want to know how to use the tracking features excluding journaling click here. 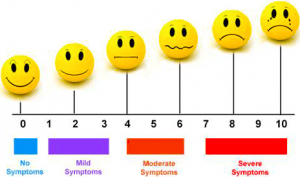 If you would like to learn about why it is important to track your symptoms keep reading. The symptom logs can be printed and used by your doctor to treat your condition more accurately by having quantifiable data. A corollary to that is that it is vital to track your symptoms as you experience them during the course of your day. TrackMyStack can be accessed via your mobile device or desktop at any time with access to the Internet, so you have no reason to carry around a diary at all times. This removes the risk of losing your diary or remembering to take it everywhere you go, as your phone will most likely always be with you. Let’s take the case of Jessica. Jessica is a 35-year-old who has a bipolar disorder and migraine headaches. She constantly goes in for checkups and reports daily headaches that last for days at a time. She says she has also “noticed” an increase in symptoms such as lethargy, and anxiety. At the same time, Jessica has been changing and trying different medications, supplements and eats out during lunchtime at different places all the time. With these many variables in place stating “a bit”, “every now and then” is not enough, the more precise the data, the easier it will be to diagnose her problems. When this information is presented to a doctor, the information sounds all too vague, is confusing and can be challenging to explain correctly. To your doctor making sense of your information is not only time consuming (as you are given 15 minutes per visit) but your information will contain many errors and biases (such as recall bias). 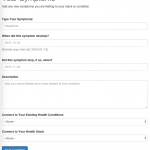 The solution for Jessica is to maintain a simple Symptoms Diary also known as patient logs. 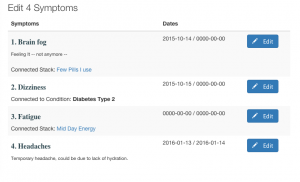 TrackMyStack has the tools available for anyone to track symptoms and daily activities (ODL’s) in a quick, organized manner that will help with your diagnosis. Time Savings – Your physician can quickly scan through your online diary/print out in seconds accurately, as opposed to you verbally explaining everything. Cost Savings – With more accurate information, you are less likely to go through radiographic testing or other unnecessary lab tests. Identification of Triggers – Looking at the graph can easily show clear patterns of symptoms occurring linked to your activity for that day, it is easy for physicians or yourself to discover triggers. 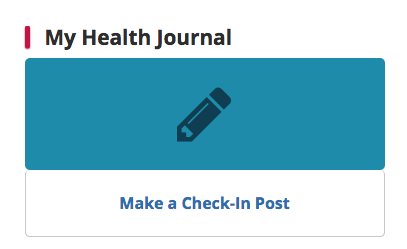 Graphs & Reports – Linked to #1 and #3 + they can be shared and gives you a quick overview of your health. Patient Engagement & Empowerment – Once you start tracking your health actively, you are likely to start making the necessary changes to get better. 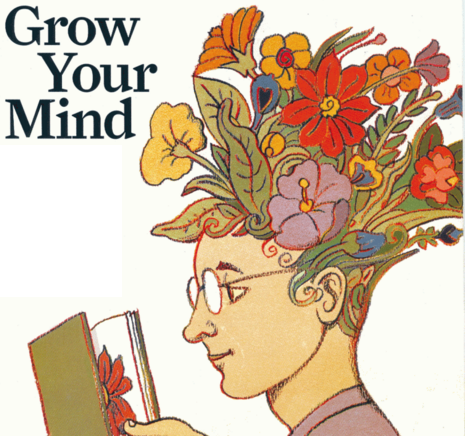 You will lessen your cognitive burden and may notice therapeutic benefit as well. Remember, what get’s measured, get’s improved. 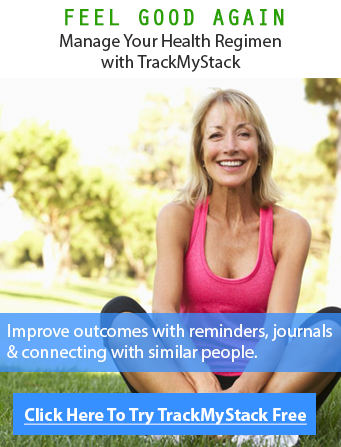 Personal Health Record – Record your activity and see how you are doing compared to others just like you on TrackMyStack. Keep your data with you at all times, and be in control of your health by maintaining your own records. Use the Diary to Journal Everything! 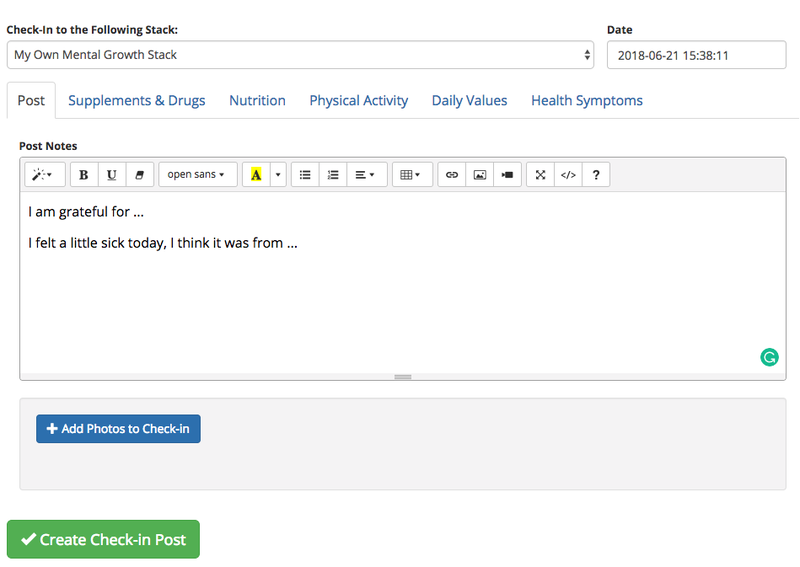 The most common types of health diaries do one thing only; TrackMyStack is the only platform that helps you manage all or any of your symptoms in a single location. To begin click here. This includes a sleep diary (to determine your, you guessed it, sleep patterns), mood diary which we write about here, a voiding diary (to measure fluid input/output), general symptoms (any symptoms such as IBS, fatigue, gas, cardiac symptoms, neurological), exercise diary, headache diary (helps with adjusting your abortive or prophylactic treatment), and a food diary (for lifestyle modification). 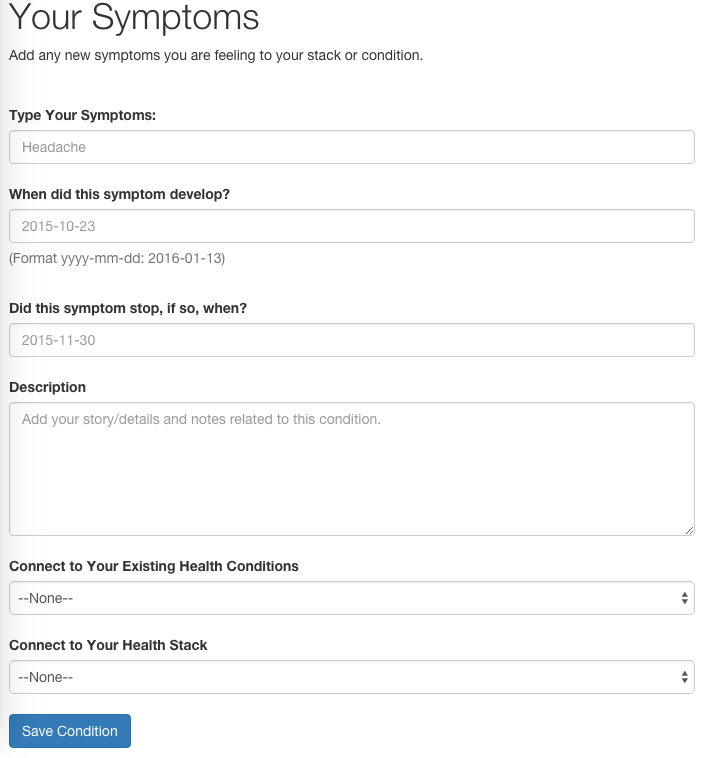 Along with symptoms, you can also use TrackMyStack to track your chronic conditions as well. #1 Non-adherence: You may feel too lazy or tired to write daily, TrackMyStack allows you to write as frequently as you want with as much information as you’d like. Obviously, however, the more frequent you write and with more detail, the better your results will be. We organize and display your diary in a structured order, so you don’t have to worry about being “neat” or following certain protocols or even remembering if you have written down all the things needed to make the entry useful. #2 Irrelevant Apps: If you are a patient, you need an app that can record your vitals, ODL’s, and symptoms; however, many food or calorie trackers or fitness apps are not right for you as they are not meant to be used as you may need to. Wellness apps are a different category than fitness apps, using the right tool for the job is key. The risk-reward ratio for using a symptom diary is heavily skewed, TrackMyStack is a simple, effective clinical tool that augments the diagnosis as part of outpatient care without any risk to you. You are free to share as much or as little as you right, TrackMyStack also does not diagnose or recommend any treatments. It is a tool used to track your activity that can then be shared with your primary care provider to assist them and yourself determine ways to improve your health. The cost of starting your stack and journaling are minimal, you need 20 seconds to sign up, and about a minute each time you experience a symptom or “flare up”. 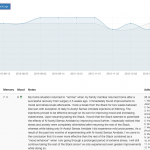 TrackMyStack can be upgraded to Pro if you need to use advanced features or to generally support the development of our platform. We have over 5,000 members that are actively monitoring their health, privately and openly. Your data can help other people solve the same problems as you and vice versa, where you can use other people’s experiences to augment your own diagnosis. When logging your symptoms in an organized manner you are committing to being a healthier you and are demonstrating that you are proactive in taking control of your health, your family will thank you for it, so will your physician, and not to mention your body. Get tracking today for free, click here. Intermittent energy restriction (IER) involves intermittently limiting energy intake levels. There are many ways to restrict calories, one method involves limiting your calorie intake to about 500 kcal a day for days to three days a week. In another method, you must consume all your daily food within an 8 hour window every day, the last way is to simply fast for 24 to 36 hours without any food. 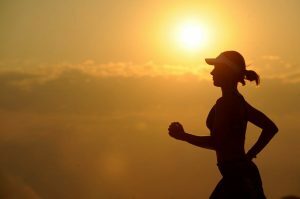 In this article, I will discuss if there is any evidence that states cognition is improved via fasting and any other interesting thing I found while doing my research that you may like as well. Let’s start by getting to know some terminology so the article makes much more sense for you. Intermittent fasting (IF) may sound technical. But all it really means is going for extended periods without eating anything if possible. Throughout the world tribes experience one form of IF or another. Among them, many show no signs of age-associated problems like diabetes, cancer, neurodegeneration, cardiovascular disease, or hypertension. Caloric restriction (CR), researchers define caloric restriction as reducing food intake while avoiding malnutrition. In animal studies, this usually means consuming 30-40% fewer calories than the standard daily requirement. That’s the equivalent of limiting daily intake to around 1,200 calories for women and 1,400 for men. CR is very different for men and women, which I explain more about below. CR has prolonged life in dogs, rodents, worms, flies, yeast, bugs, and non-human primates by 30 to 50% (evidence below). Alternate Day Fasts Alternative day fasting (ADF), as the name implies you do this every other day or Every other day Fast (EODF). 24 Hour Fasts, done few times a week to achieve the same results, may be more difficult for beginners. 16/8 Fasts (Time Restricted Feeding) is what we will be discussing when referring to IF below. The best way to begin fasting is by giving your body 12 to 16 hours between dinner and breakfast every single day. This allows 4 hours to complete digestion and 8 hours for the liver to complete its detoxification cycle. That mean’s give yourself eight hours or more of ‘feeding time’. The rest is a no ‘feed zone’. Ketosis is characterized by raised levels of ketone bodies in the blood/body associated with fat metabolism. Meaning you are obtaining your energy from fat rather then glycogen (think carbs). The brain prefers to run on fat (via ketone bodies) , these energy molecules become fuel for our brains after being converted from fat by the liver. This can only happen when insulin your bloodstream is low, the lower it is the higher the ketone production. You can be in different levels of Ketosis but scientifically if you are at 1.5 – 3 mmol/L it is considered the optimal state but from a nutritional standpoint 0.5-1.5mmol/L is considered good enough. In humans, excessive energy intake is associated with increased incidence of cardiovascular disease, diabetes, and certain cancers and is a major cause of disability and death in industrialized countries. On the other hand, the influence of meal frequency on human health and longevity is unclear. Both caloric (energy) restriction (CR) and reduced meal frequency/intermittent fasting can suppress the development of various diseases and can increase life span in rodents by mechanisms involving reduced oxidative damage and increased stress resistance. Many of the beneficial effects of CR and fasting appear to be mediated by the nervous system. For example, intermittent fasting results in increased production of brain-derived neurotrophic factor (BDNF), which increases the resistance of neurons in the brain to dysfunction and degeneration in animal models of neurodegenerative disorders; BDNF signaling may also mediate beneficial effects of intermittent fasting on glucose regulation and cardiovascular function. So basically, there is a increase in BDNF, but since the study was not conducted on humans, we can’t definitively state that it can increase human lifespan or overall health. BDNF is a protein that interacts with neurons in the hippocampus, responsible for regulating memory and learning. It helps neurons survive and grow new neurons via neurogenesis and increases the development of synapses between neurons. Sounds like something those looking to keep their brain healthy and functioning optimally may want. Being low on this stuff has been linked to many diseases such as Alzheimer’s. BDNF is naturally occurring and has been extensively tested on mice and in each case it has shown to significantly improve the learning capacity, working memory (Working memory is how many pieces of information you can juggle in your mind at any given time) and cell signalling [reference]. Lose Weight (Shed Fat) – Easier to maintain low body fat, via insulin sensitivity for skeletal muscles. Might be better, burning fat, using fat rather then carbohydrate. Longevity (Mediated mostly by AMPK pathways). Helps deplete damaged mitochondria and is anti-inflammatory, although not proven definitively. Increased Growth Hormone – Fasting for more than 6 hours begins the cleansing phase. The cleansing phase is catabolic in nature in that it tears down old damaged cells. These genetic repair mechanisms are turned on through the release of human growth hormone (HGH). HGH also improves skin function, reduces wrinkles & heals cuts and burns faster. Researchers at the Intermountain Medical Center Heart Institute found that men, who had fasted for 24 hours, had a 2000% increase in circulating HGH. Women who were tested had a 1300% increase in HGH. When it comes to IF and the it’s benefits, I repeatedly came across the name Mark Mattson. Mark Mattson (a neurologist at Johns Hopkins University and the National Institute of Health (NIH) research is cited in most if not all ‘important’ papers discussing IF online. His research states (in short): Fasting reduces oxidative stress, cognitive decline and mitochondrial dysfunction that normally results from brain trauma, so when researches put rats on a 24 hour fast it proved to provide neuroprotective results. This study discusses how Human (and non-human) studies show that IER increases synaptic plasticity (marker of learning and memory), enhances performance on memory tests in the elderly, leads to the growth of new neurons, decreases risk for neurodegenerative diseases. With EODF implemented after rat cervical spinal cord injury was neuroprotective, promoted plasticity, and improved behavioral recovery. Without causing weight loss, EODF improved gait-pattern, forelimb function during ladder-crossing, and vertical exploration. In agreement, EODF preserved neuronal integrity, dramatically reduced lesion volume by >50%, and increased sprouting of corticospinal axons. As expected, blood beta-hydroxybutyrate levels, a ketone known to be neuroprotective, were increased by 2-3 fold on the fasting days. In addition, we found increased ratios of full-length to truncated trkB (receptor for brain-derived neurotrophic factor) in the spinal cord by 2-6 folds at both 5 days (lesion site) and 3 weeks after injury (caudal to lesion site) which may further enhance neuroprotection and plasticity. Depression – Decreased – Anti depressants are known to increase BND signaling and synthesis in the hippocampus. Most of the studies have been done on rodents but it is plausible that intermittent fasting may help alleviate depression to an extent. 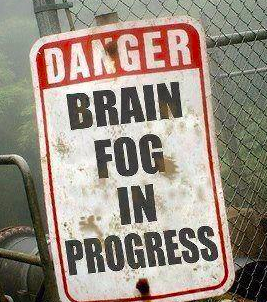 To reduce “brain fog” (Brain fog may be described as feelings of mental confusion or lack of mental clarity. While on the diet, there are two options, one is to have a low calorie drink (less than 50kcal, if your energy level is dropping and ketone energy just isn’t doing it for you, and consume it with nootropics which may potentially help with brain fog.) Consume water. Keep in mind the mind-numbing hunger feeling subsides over time, in up to 6 weeks (on 5:2 diet — 5 days off, 2 days on with CR). If you are trying IF and just feel like your brain fog is not subsiding, and you are just feeling too drained, you may want to consider taking supplements that may help, some can think it is a form of cheating, but it is up to you to decide if you want to go this route. First one would be a drug called Modafinil will suppress your diet and provide you the mild CNS stimulation you may need to ‘get work done’. I will leave you to check out the link to learn more about this one, and its similar compounds like Adrafinil or Armodafinil (Provigil). Number two is taking nootropics such as Phenylpiracetam, Caffeine (pill, and definitely not with sugar and creamer or milk! ), one will give you a jolt of energy and the other will keep your brain focused. Some people on reddit and around the web have provided anecdotal evidence of ALCAR being effective to stave off hunger, other’s have even recommended a herbal tea’s known as Kratom. Note on these supplements: The benefits should be worth your time and counteract any negatives. As for women: Research has stated that in the long run, IF can disregulate a women’s reproductive system, but these aren’t conclusive. If you are a women, you should listen to your body and tread carefully, also watching out for signs of hypothryoidism and amenorrhea. A new type of fast, since we are fans of Bulletproof we are mentioning it here. You could try another coffee company and any other MCT Oil (or better) just make sure you consume the right one (as described in the video). Bulletproof has been known to be somewhat of a “reliable source” for us and that is why it is being recommended and we do get referral fee if you use the link below (with no added cost to you!). 8:00 AM: Drink Bulletproof Coffee. 2:00 PM: Break fast with foods from the Bulletproof Diet. 8:00 PM: Eat your last meal before beginning the fast. Bulletproof Coffee – Said to be very low in mycotoxins and considered a premium coffee. Grass Fed Butter – Anchor brand works and use very low amounts. My take: Although not a real fast to get your body running on ketones, this does get’s you into a mild ketosis, and maybe more ‘practical’ for most people, but needs more research. However it is simple enough to try and many communities online swear by it. Most fasters do allow themselves coffee, teas and other non-caloric beverages during the fasting. Generally acknowledged that drinking a beverage with fewer than 50 calories will keep you in a fasting state. Anecdotal Evidence by members of “The fast Diet” 5:2 diet however state that they noticed up to a 50% improvement in memory. For both of these we don’t know if the member’s have any sort of memory problems, and of other confounding variables. 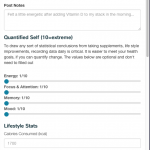 TrackMyStack (TMS) – If you want to really try Intermittent Fasting and want a measurable way to record your general health (and performance, or ODL’s) consider using a Stack Journal to do so. You can’t see what’s working and what’s not if you are not actively quantifying your mood, side effects, anxiety etc and we are the perfect platform to do so. I have a journal which I have been using for the past month and it shows me that I have been able to put off eating for longer amounts of time because now based on my diet, I feel satiated for longer amounts of time and my mood is generally better as well. 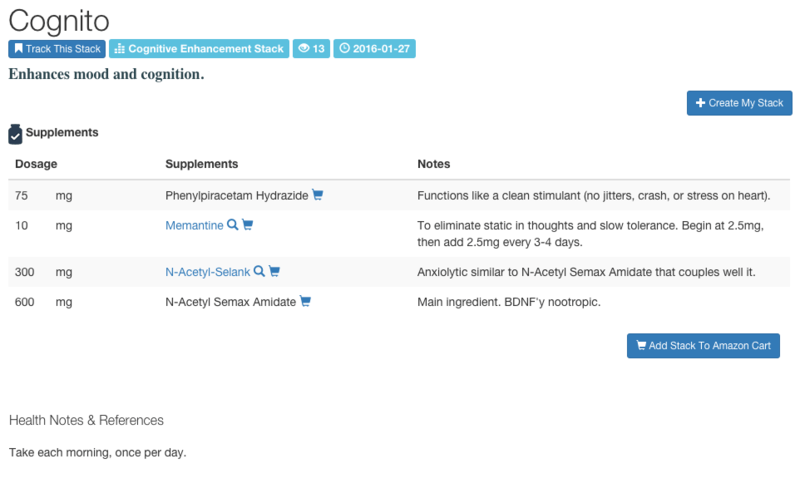 It’s not just me that is tracking this stuff, check out this super in-depth stack of a user trying to increase BDNF. I wish you the best of luck, IF is something anyone can try and play around with without harming themselves too much (or needing much to start). Remember, there are many types of fasts that can be undertaken if one does not fit to your liking. You may will experience grumpiness and headaches at first, but with some will power it can be overcome. Most studies as referenced to, do link to non-humans trials but some have been tested on humans and the results are somewhat similar. The supplements mentioned above and Bulletproof intermittent fasting are some ways people cope and try out IF and you are welcome to try them (but I recommend only do so after you have attempted ‘regular’ IF.). Go ahead and get started, create a TMS account and track your progress towards better health cognitive health. Supplements are an addition to a optimal diet, thus there is no best supplement for anyone. However, there are supplements such as Vitamin C or Magnesium that everyone probably lacks in. Below is a re-print of a pretty well summarized post as to what you can take, originally found on PasteBin. Vitamin B1 – Thiamin – 20mg/day – performs decarboxylation reactions; required for complete catabolism of sugars and keto acids; destroyed by alcohol use; deficiency produces neurasthenia, neurodegeneration, and metabolic syndrome. Vitamin B3 – Niacinamide or Niacin – 250 or 500mg/day (up to 2g/day; requirement is substantially increased during stressful conditions, eg. schizophrenia, and liver disease) – Precursor to NAD and NADPH, the most fundamental cofactors in living organisms. Functional deficiency affects all life processes. NADH is used to extract high-energy electrons from food-derived carbohydrates and proteins. NADPH is widely used by proteins in biosynthetic electron transfer reactions and is part of some antioxidant enzymes. Supplementation has been repeatedly found to have significant benefits in many (perhaps most) degenerative diseases. Niacinamide inhibits the breakdown of NAD. Vitamin B5 – Pantothenate – 25mg/day – part of Coenzyme A; essential for fat metabolism and oxidative respiration; excessiely excreted in metabolic syndrome. Vitamin B6 – Pyridoxal-5-Phosphate – 15mg/day – prone to oxidative destruction, especially when B3 is deficient; central to amino acid metabolism; deficiency arrests ‘non-essential’ protein synthesis; opioid addiction depletes vitamin B6. Vitamin B9 – TetraHydroMethylFolate – 200ug/day – required to remethylate S-Adenosyl-Methionine; most people are functionally deficient; requirement increased by B12 deficiency; opioid addiction depletes folic acid. Vitamin B12 – Methylcobalamin – 1000ug/day – normally produced by gut bacteria, which are impaired in everyone; required to recycle folic acid to allow for methylation; deficiency is associated with neurodegeneration. Perhaps consider a High Bioavailable version of Vitamin B, click here to see one we recommend ($20). Na-R-ALA – 10-100mg/day; along with thiamin (Alpha Lipoic Acid), oxidizes pyruvate produced by glycolysis; water/fat soluble antioxidant that recycles endogenous antioxidants; effective and non-toxic heavy metal chelator; low plasma levels are indicative of metabolic syndrome/diabetes; supplementation restores insulin sensitivity in diabetes and associated conditions (eg schizophrenia). Vitamin D3 – Cholecalciferol – 5000 IU/day in winter, less with more sunlight exposure – produced from cholesterol by UV light in human skin. Mushroom skin produces the related compound Ergocalciferol, Vitamin D2, which can partially substitute for our own D3. Prevents calcium accumulation in soft tissue, plasma; prevents osteoporosis, may alleviate depression. Vitamin E – d-Tocopherols – 30IU/day – up to 400IU/day depending on meat and PUFA consumption. Supplementation is not required if you eat only fruit. In most cases, avoid taking over 400IU/day. Best is to take a,b,g, and d (‘mixed’) tocopherols and tocotrienols rather than just a-tocopherol. Required for the hydrogenation of excess unsaturated fats and the prevention of their oxidation; spares and restores CoQ10. Antagonizes some of the effects of estrogen. Magnesium – Magnesium Glycinate/chelate – 50-200mg/day Mg – required for ATP synthesis and retention; required for calcium absorption and utilization; prevents muscle cramping and bruxism. Consider L-Threonate for cognitive enhancement as it passes the BBB more easily into the brain. Vitamin K2 – Menaquinone – 2mg/day – required for protein carboxylation; prevents bone demineralization and soft-tissue calcification; necessary for proper vitamin D and calcium metabolism; required for effective blood clotting. Vitamin D supplementation necessitates vitamin K supplementation. MK4 is the most active form of vitamin K in non-hepatic tissues. Zinc – Zinc Picolinate/chelate – ~10mg/day of zinc – required for some antioxidant enzymes (Zn-SOD); required for insulin synthesis; various metabolic roles. Required for MAP binding to microtubules, and hence the structural integrity of neuronal dendrites. Disruption of Zn metabolism by aluminium is related to alzheimerism. Consider ZMA. Selenium – Selenomethionine – 100ug/day – required for some antioxidant enzymes (GPx); required for the conversion of thyroid hormone to its active form (T3). Deficiency is associated with schizophrenia and diabetes. Chlorella/Spirulina – 1-20g/day – single celled algae; extremely high in nearly all vitamins and minerals, as well as a wide variety of other biological molecules – good for detoxification. Can be eaten in unlimited amounts, like food. Vitamin C – Preferably Magnesium, Potassium, or Sodium ascorbate – 10g/day; up to 300g/day for severe degenerative diseases – Apes cannot synthesize vitamin C and require enormous amounts from our diets. Required for many reduction/hydroxylation reactions (eg, synthesis of collagen, norepinephrine, carnitine). Spares and restores other antioxidants such as vitamin E and ALA. Subclinical deficiency impairs capillary integrity and catecholamine metabolism; promotes CVD, cancer, parkinsonism, schizophrenia, diabetes, and most other degenerative diseases. Cannot be obtained in even close to sufficient amounts, even on an all-fruit diet, since domesticated fruits are much lower in vitamin C and flavonoids than wild ones. Large (25g+) doses can be used to overcome opiate addiction, and to relieve pain. Adverse effects are extremely uncommon, with the exception of gastrointestinal discomfort at very high doses (which may itself be therapeutic). Flavonoids – >500mg/day – catechol flavonoids are required for vitamin C activity; flavonoids improve the efficiency of many metabolic processes; substantially expand the protective capabilities of endogenous antioxidants; largely responsible for the health benefits of many foods. Berries, tea, chocolate, onions, and wine are well-studied sources. Reishi/Cordyceps/Lion’s Mane – 1-5g/day – medicinal mushrooms; contain a multitude of natural nootropics, including noopept-like substances; broadly effective at preventing and reversing brain damage. If you had to choose six of these, they’d be Vitamin B3, Vitamin B6, Vitamin B12, Vitamin C, Vitamin D, and vitamin K. They are inexpensive and nearly everyone is functionally deficient in them. Everything listed should be taken by anyone living in civilization who seeks to avoid disease and prevent aging. For Vitamin C, try to find one that also includes flavonoids. For B3, niacin works about as well as niacinamide but also produces flushing and has blood lipid- and cholesterol-lowering effects. 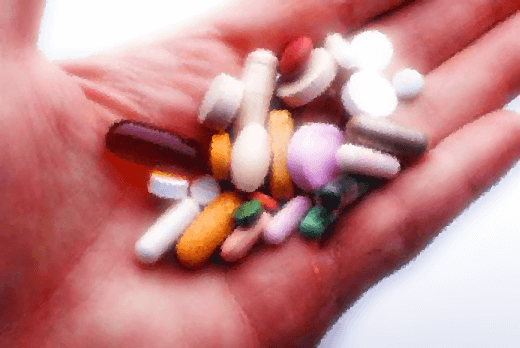 Tracking your medication intake is the single most important thing you can do to recover from any condition or symptoms you may be going through. Skipping a dose or worse yet not remembering can have detrimental consequences on your health and even other’s around you. If a dose is skipped or forgotten, it can throw your treatment into limbo and you may need to consult your primary care provider to assist you in determining how to get back on track. However, there is a solution, a simple way to remain on track and remember if you have taken your medication or not and how it made you feel and what symptoms you experienced through taking the medication stack prescribed to you. The solution if it doesn’t seem obvious, is TrackMyStack. Below we will show you how our simple app lets you manage your pain, anxiety, stress, mood, and helps you save your thoughts in a log which can be exported or printed and presented to your caregiver, clearly showing the pills you took (the adherence to it), the exact time, the symptoms you felt and an arbitrary description of how you are or anything else you would like to note. On top of this, you can do this for as many different conditions, symptoms, or health goals you may have all for free. It is absolutely amazing to discover a pattern which can change your life for the better. There is a saying that you can not improve that you cannot measure — at least in some way. Once you realize the and notice the difference (and perhaps get over the burden of recording your daily activities in the log, you can rest easy knowing — you are taking everything in your power to improve your health). 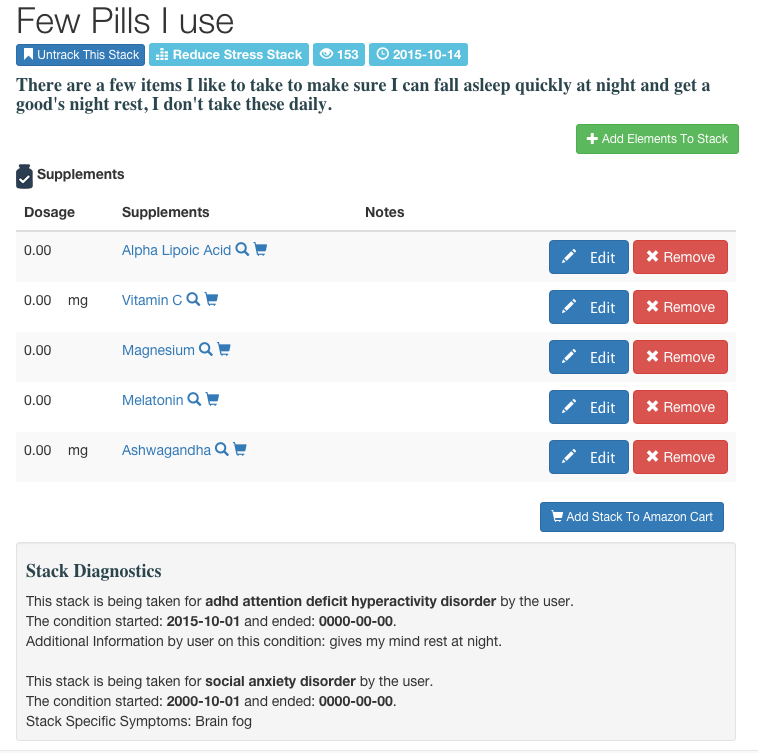 A stack is inherently designed in such a way that you can’t just “record your mood or anxiety”, the medication tracking component or “Stacking” aspect inherently makes you take ACTION against your symptom or condition. It does not need to be drugs or symptoms, but the creation of a stack is necessary to record your progress. Below we will quickly show you a few screenshots on how to go about record taking your medication in 3 simple steps. Step 1 – Get Started – To Register: click here. 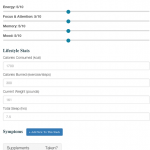 Involves typing in your supplements, prescription/OTC medicine, or anything you would like to track. We help auto-fill your pills, saving you time and also give you a recommendation and select the unit of measurement, so inputting and getting started is as painless as possible. 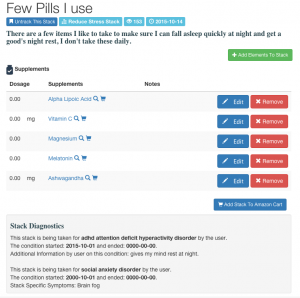 A recent addition also provides recommendations based on existing treatments/stacks on what you can add to your stack that is effective for existing patients. Even though we provide the example with supplements, drugs, patches, drops, ointments, injections, herbal, vitamin, diet supplement and anything else you are doing can be added. We are working on an android and apple apps that will remind you to take your medicine at the right times. 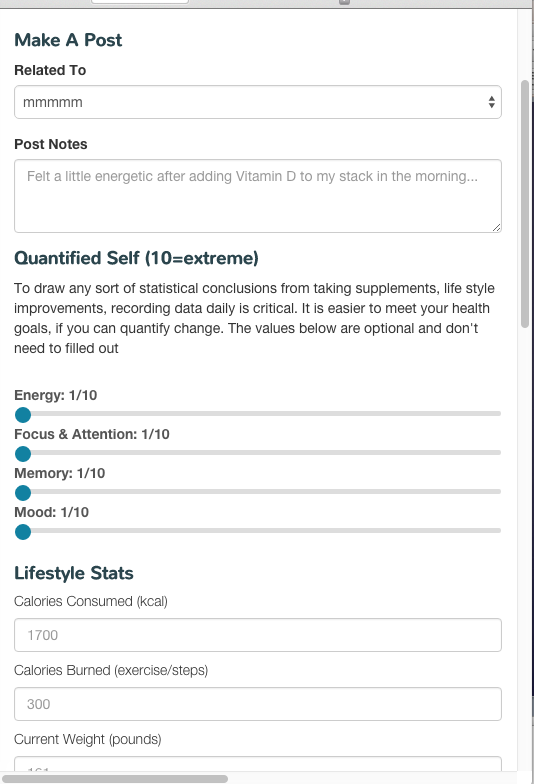 The screenshot below skips the first part of the log where you can write your notes about taking this dose, however, it does not show you how you can record a multitude of other things such as your energy levels, focus, memory, and mood. 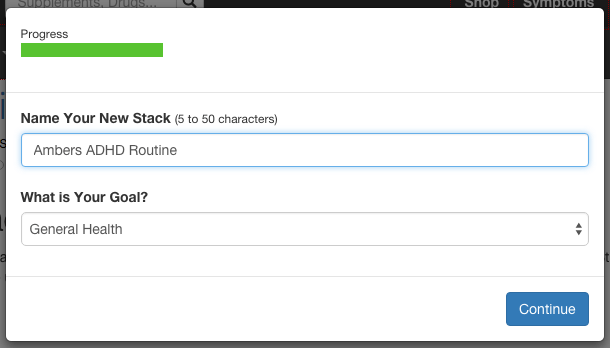 By default all medicine in the stack is set to on to speed up the process of making a post. 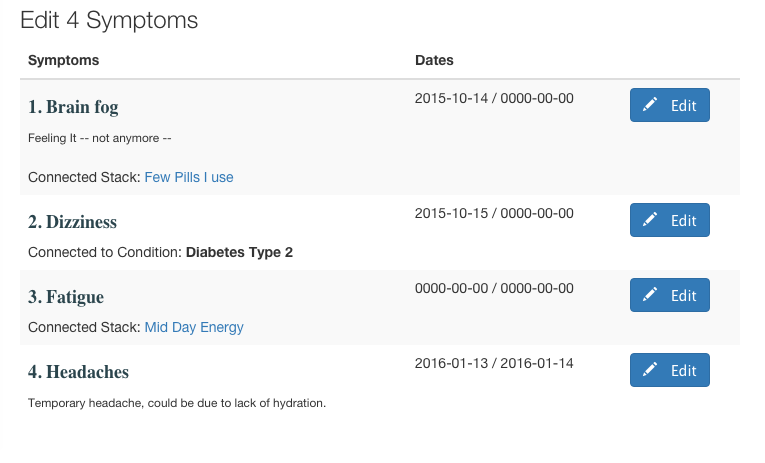 Once the entry is saved it can be viewed on your StackLog which shows your Adherence level and your notes, and not included in this entry is how you may also attach an image to your medication log. 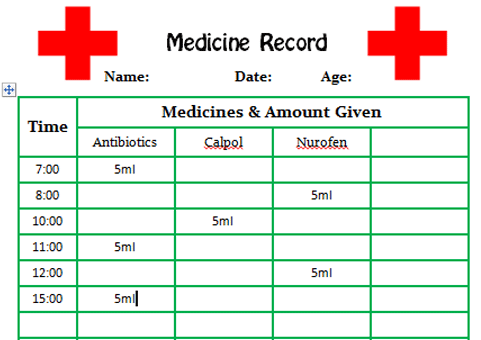 The medicine schedule can be printed and looks great. It can be better than typing it out in excel or spending time making your own chart, and this way you can quickly edit or modify it whenever and from wherever. You can further make it and easily share it with your health provider as well, you can even ask your pharmacist or care provider to make the schedule or chart stack for you and put it in private mode if you think that is a better option. 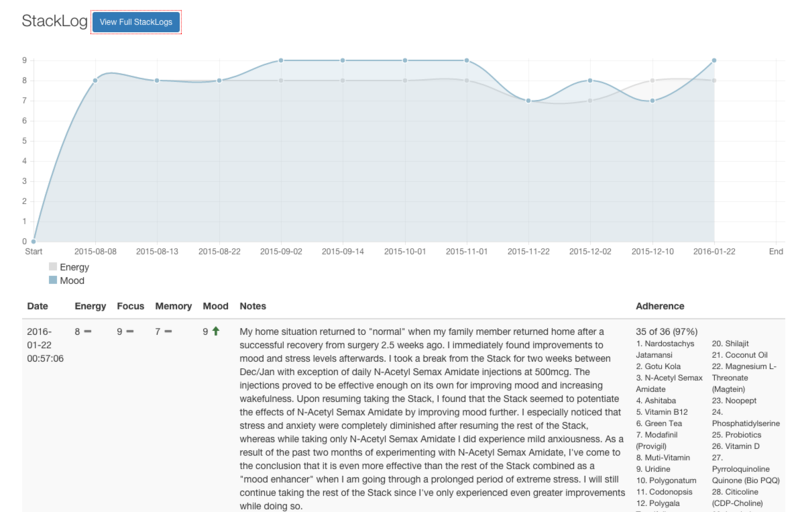 Below is what the chart looks like once it has been created, keep in mind this is not the stackLog which keeps a record of when you took your medication. 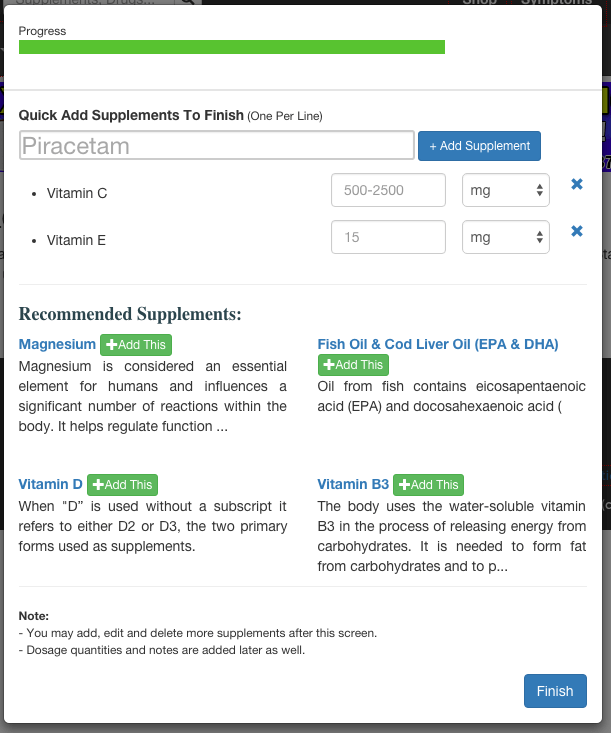 We make it easy for you to learn more about the supplement or drug you may be taking, we also allow you if it’s a supplement and legally allow you to buy it from a high-quality reliable source online. Additionally, if you feel like someone else’s stack makes sense for your health goal, and there are no interactions with your existing stack (as confirmed by preferably a pharmacist), you can order the stack directly from Amazon with the click of a button. The graphs that are generated as mentioned earlier provide a comprehensive way to quickly understand what is causing your symptoms, aside from you printing out this medical log for your doctor, you may also get comments and recommendations from the community who is going through the exact same thing as you. The online version can fully be utilized as an app as the site is mobile friendly. One main thing to keep in mind is the fact that the site is more than just a simple pill tracking or medicine reminder app. 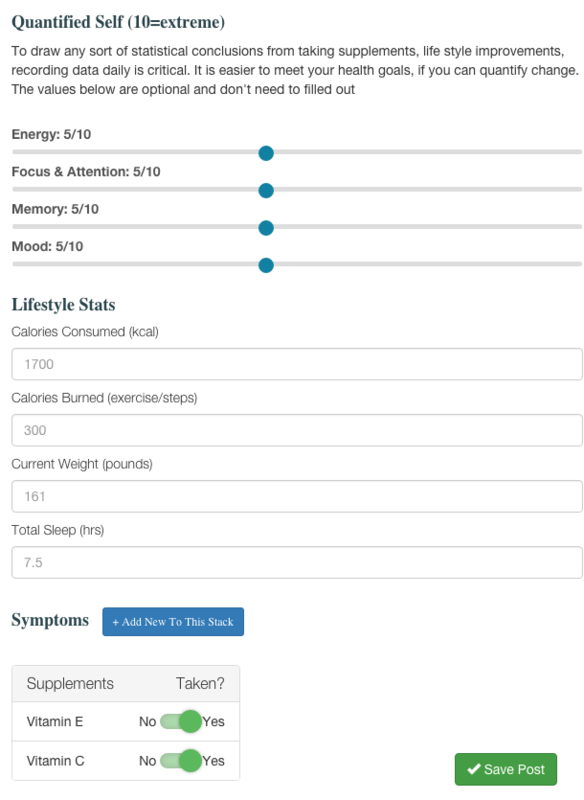 The site will help you remember what you need to take, it will record the progress of your treatment to measure effectiveness, but it will also work to help you learn more about yourself and your treatment via graphs, charts, logs, images and via the community. In conclusion, TrackMyStack can be referred to as a simple Health Tracker for managing conditions and symptoms to not only dose safely but also to validate its effectiveness. It is perfect for children, adults and especially the elderly. 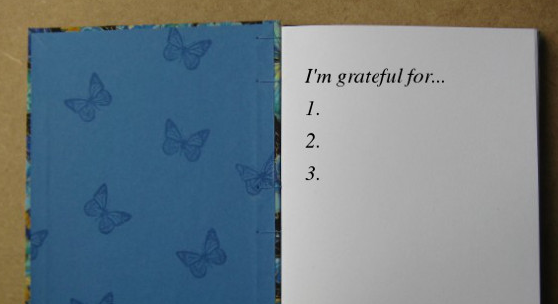 We hope it helps you become a better you. To get started instantly click here.